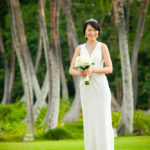 Mamiko & Kensuke were married at the Mauna Lani Bay Hotel on the Big Island of Hawaii. They had their ceremony at the Milo Tree lawn and then photographs around the resort afterwards. The couple came from Japan for the wedding as did most of their guests.